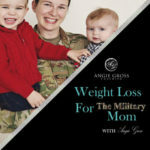 Welcome to the 11th episode Weight Loss For The Military Moms Podcast. In this episode I talk about the wasting of food and journaling. So many people are afraid to waste food when they go out to eat, but what is the alternative? Also, so many people don’t like to journal their food, but it is because they aren’t doing it properly. Listen to this weeks episode to find out more.